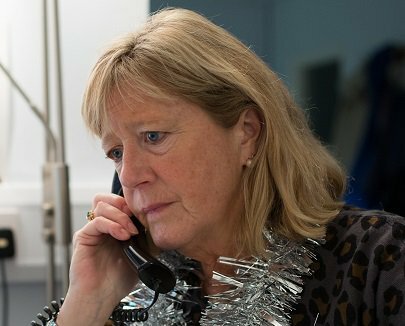 More than 11,000 volunteers across the UK and Ireland will be working shifts for the charity to ensure its helpline is open round the clock, even on Christmas Day and New Year’s Eve. At the same time, Samaritans is encouraging us all to give the gift of listening by telling friends and family it’s ok to open up if something is troubling you. To make it easy, the charity has produced a set of vouchers that you can download from its website to give as presents, offering yourself as a listening ear. You can invite someone to confide in you over a coffee, while out on a walk, or in whatever way you feel they will be most comfortable with. Socks won’t save a life, but listening can. 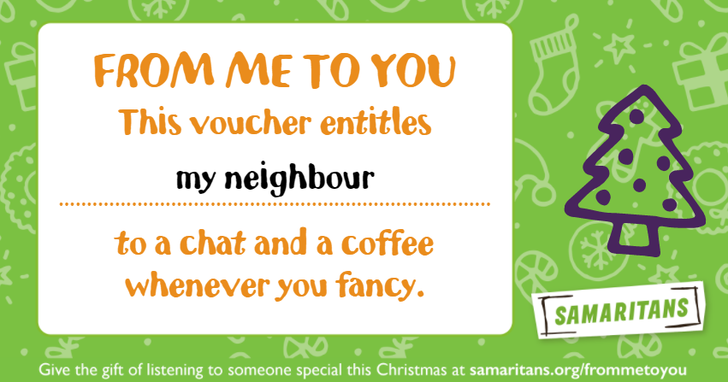 You can download Samaritans’ Give The Gift of Listening vouchers for free at www.samaritans.org/vouchers. You can also give the gift of listening with a donation to help ensure that Samaritans’ services are there for anyone who needs them this Christmas and every single day of the year. Find out more about Samaritans’ Christmas campaign at www.samaritans.org/frommetoyou. Help us spread the word on Facebook, Twitter or Instagram, #GiveTheGift. For further information, photos, interviews and case study requests, please contact [email protected] or 020 8394 8300. More photos are available of a wide variety of listeners and #GiveTheGift of listening vouchers. Anyone can contact Samaritans any time for free from any phone on 116 123. This number is free to call and will not show up on your phone bill. Or email [email protected] or go to www.samaritans.org to find details of your local branch where you can talk to one of our trained volunteers face to face. *Based on the number of volunteers on duty between 18 December 2016 and 1 January 2017. Source: Samaritans Contact Systems Data. **Samaritans responds to more than 5.7 million calls for help every year and expects to respond to around 10,000 calls on Christmas day alone. Caller concerns by frequency are based on data collected between 26 April 2016 and 31 March 2017 from more than 1.86 million calls. Source: Samaritans Contact Systems Data.